J. Pierpont Morgan [1837-1913], New York. 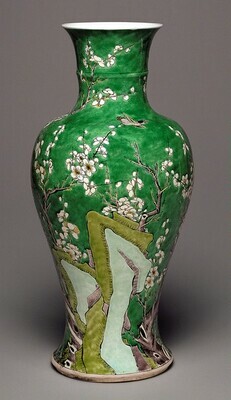 (Duveen Brothers, New York and London); sold 1915 to Peter A. B. Widener, Lynnewood Hall, Elkins Park, Pennsylvania; inheritance from Estate of Peter A. B. Widener by gift through power of appointment of Joseph E. Widener, Elkins Park, Pennsylvania; gift 1942 to NGA. The vase was thrown in two sections and luted together at the widest point. The raised band around the neck is a result of the body above and below having been shaved down with a sharp tool as it turned on the wheel. The interior and the recessed base are coated with a thin glaze. A large chip in the shoulder has been repaired and repainted. Morgan 1904-1911, 2:64, no. 1227, pl. 101. Bower, Virginia, Josephine Hadley Knapp, Stephen Little, and Robert Wilson Torchia. Decorative Arts, Part II: Far Eastern Ceramics and Paintings; Persian and Indian Rugs and Carpets. The Collections of the National Gallery of Art Systematic Catalogue. Washington, D.C., 1998: 154, color repro.